Natural disaster in Selo at our center “Tala Mosika”!!! 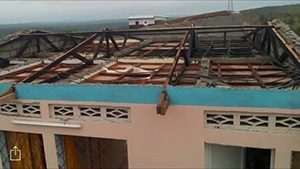 International Children’s Football Alliance stakeholders River of Hope have put out an emergency appeal; Heavy storms in Selo, have demolished yesterday between 4-9pm the roofs of the dorms of our staff/teachers and the house of our project manager Christoph, all other buildings are fine. We are happy to inform you that nobody has been hurt but they are under shock!!! The heavy rain soaked and destroyed also all personal items, furnishing and lots of equipment. We need help! Please donate – every Cent counts and forward to people, companies, foundations who might be able to help us. Thank you to Roselyn Roy a dear friend of the project who helped us with the translation of the interview. An interview by Christoph Mbedi, Responsible for the Tala Mosika Project and journalist, with Jean-Marie Vianney Nshombo, Ciperfoot, Coordinator of the Football Initiation and Development Centre. Q: Would you please, Mr. Jean-Marie, introduce yourself to our viewers and provide us with information on your organization and on the work that you do. A: Thank you very much Mr. Christoph, Mr. the Journalist. 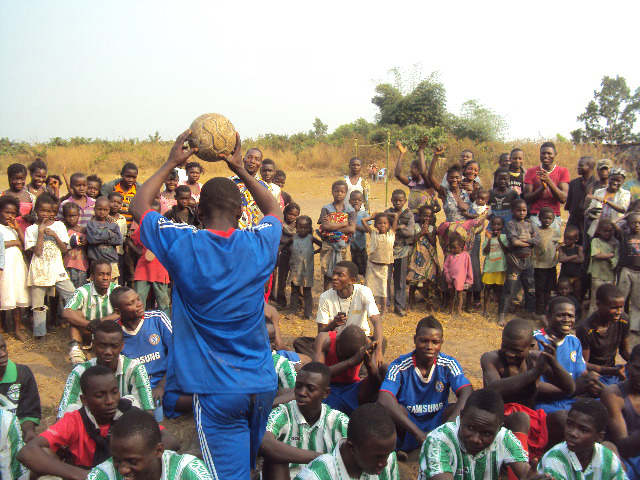 My name is Jean-Marie Vianney Nshombo, Coordinator of the Football Initiation and Development Centre Ciperfoot. We are a not-for-profit organization under the Congolese law, created on May 29 2010 and we have a sport school that includes environment, health and education aiming at tutoring unprivileged orphan children and other children to help them reach graduation. Q: What are the objective and the mission of you work? A: As I said earlier in my introduction, we wish to educate children, starting from their existing -or not- talent in football, in order to provide them with a future and make them efficient towards themselves and society, using football as an opportunity, which in fact is the basic activity of our organization. Q: Who benefits from your organization and how do you wish they benefit from it? A: We target young children aged between 9 and 15, and we hope that all, girls and boys, can learn how to play football, as well as get a life discipline. We educate them so that they become useful to society and to the nation. Q: Within your organization, who works for the organization and who does volunteer work? A: Our organization counts 12 founding members, who are all volunteers, tough three of them are technical trainers who get a small retribution. Q:Can you tell us on which days are your activities are spread? A: We work almost all week. The football training with the kids take place on odd days. After class, the kids take a rest and eat, and get back to the field around 2:00 or 3:00 pm on Mondays, Wednesdays and Fridays. Even days allow the technical trainers to prepare the training sessions for the kids. Q: What is the importance of fun, pleasure and sport in what you do? A: As coaches confirm, football is a fun and pleasant sport. The kid must, first of all, feel the pleasure of playing, and offer the audience that same pleasure. It is important to us that the kids be in good health, strong and efficient. When they aim to join other teams as good players, they must be able to keep and live the pleasure of playing, in order to stay away from violence and other mischiefs. The fun of playing must remain central today and in the future. Q: What advantage does the Peace football offer to education? A: Through the FIFA Fairplay Code that we received, kids learn to support each other. They learn to like each other before, during and after the game or after the practice, or after a particular game. Therefore they benefit from an education on self-control, and on the pleasure of giving and being in peace with their neighbor, on offering peace to their neighbor. This aspect is very important to us in our organization and in our curriculum developed for the kids. Q: Mr. Jean-Marie, between us, is childhood important in Democratic Republic of Congo? A: Yes, Democratic Republic of Congo has children everywhere, of all ages and even in conflict zones. The child needs a place to play, the child needs to a place to laugh, to scream and to move around. DRC, as other countries, is well aware of this and makes efforts, as other countries around us do, to provide the children with this necessary space to play and provide peace to all children. A broken child will not be able to give in his life. 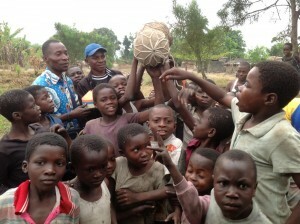 So our organization aims at helping DRC to provide the kids with this space for peace, pleasure and development. Q: Do you think that, once in place, peace will provide kids and adults a reason to promote peace through play? A: Yes, as soon as kids start playing, as soon as they reach the football field, we see adults interested join them, they come and watch, and we see that they take pleasure in watching the children play. And if during a game there is a conflict between players, we see parents, even though there are coaches on site, we see parents and adults intervene to resolve the conflict, to bring peace back on the site, to bring peace back around the ball. Promotion of peace is intrinsic to the hearth of the adults. Children, while growing around them, get this importance of peace and make it their own. A peace they will keep, promote and offer around them. So peace is always important to both adults and children on a football field, even though it is a contact sport. It is important to learn to understand each other, it is important to learn to shake hands and make piece once and for all. Q: Do you think Mr. Jean-Marie, that the link with schools from around the world will be appreciated by the kids and the adults living in the village? A: We are proud and we thank the Peace Field Project. It is important to us to thank them and tell them that we have hope in seeing this link with our village materialize. This twinning will bring a lot to the village. We are in a village where people still do not know themselves, a village that does not realize what it really is. But gradually, with help and support from this great organization, we think that this twinning will be of wonderful help and support to the village. So we insist that they come and help us promote the village, promote the kids and promote all who will eventually join us in this great development project so that the whole village and the kids become wonderful citizens of this country and of the world. In December 2012, we purchased in Selo, Kasangulu, Bas Congo, in the outskirts of Kinshasa, 4ha land. In Spring 2013 we could straight away start the construction of the center” Talal Mosika ” thanks to all the sponsors and foundations. It is hard to believe that in fall 2015, just after 2 ½ years we inaugurated our 7th building & 2 converted containers. Of course we still have a lot planned but now the infrastructure is such that the program can start holistically. With the aim of stimulating the local economy with a micro-economic approach in order to achieve sustainability are already the first success stories. It clearly requires a lot of patience and time, training, and discussions with the local people. There needs to be a rethink, so that they can free themselves from the cycle of poverty with our assistance. In this annual report we present all the activities of this past year. Let’s start with the highlights. Please download the report from here. 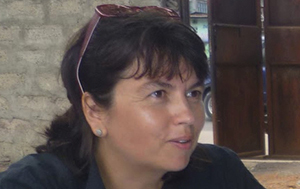 Claudia Doron would like to thank all for following River of Hope News, and supporting their projects in Congo. Claudia says, ‘We are very happy to send you our yearly report 2014’. Please can you introduce River of Hope to the NCFA? What is the aim of the organisation? CD. River of Hope is a non-profit organization that I founded in February 2010 in Buchs/Switzerland together with my husband Jake. This was the realization of a 20-year old dream inspired by the work of my father in law, Dr. Nathaniel Doron, a former UN Official and Diplomat. I picked up the thread following in his footsteps and named the organization “River of Hope” after the title of his biography. Our purpose is to assist needy and willing communities and other target groups to help themselves and others, and improve their standard of living for future generations. Why was River of Hope formed and why did you create a football school in DR Congo? CD. As a former Swissair flight Attendant, I had the chance to visit the airline’s project in Nairobi, a school for poor children. I was so impressed by their dedication and achievements, that I told myself that one day I will open a school for children somewhere in the world. The question is, how you go about it, poverty is all over the world. My husband Jake and I took the unconventional route and decided to create River of Hope with out a cent, with the belief that the right project will find us. To our surprise, this happened 6 weeks later when Véronique and her husband Roberto came to me and ask for help. She is Congolese married to a Swiss, and living in Switzerland since the late 90’s. Her brother Jean-Marie Nshombo, a trained football coach, had a well-matured project idea for a football school for street children. His dream was lying in a drawer for over 10 years waiting for someone to help. Sadly he could not afford to get this going, and we immediately felt it was the right thing for us. Working together with a Congolese/Swiss who knows both cultures and languages was definitely an advantage to get things moving forward swiftly. Six weeks later I flew to Kinshasa, my luggage jam-packed with 46 kg of football material. There I met an amazing team, now dear friends to my family and me. I made it clear that we were starting with no financial backup, but with a great idea, and a huge dosage of willpower. If we all worked really hard our project would soon take off. Officialising things was the highest priority and so we became the first registered football school for vulnerable children in DRC. 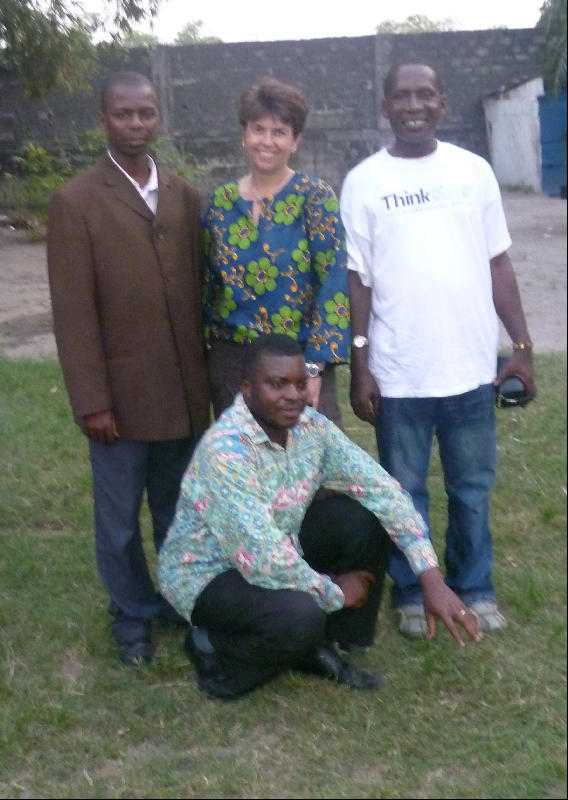 In 2013 we started building the Centre “Tala Mosika” (look beyond in Lingala), outside Kinshasa. How would you describe the River of Hope team and how long have you been working there, what do you enjoy about your work and what do you not enjoy about your work? CD. As you already know, I am the founder and also the Head of Projects. We have the best team ever, who have put in countless voluntary hours in this project. What I love is that on more than one occasion we proved that the unconventional is possible. We started without a cent in a very poor and corrupt country, and we met the most wonderful people and made so many good experiences. I am so proud to be able to tell the world that good things can happen in Congo. Of course communication is not always easy, and although both my husband and I are fluent in French, there is still that element of cultural difference and misunderstanding. But at the end we always manage, and with time we have learned to truly understand each other. This is Veronique’s forte: she speaks Lingala to the village people, many of whom are illiterate, but still need to be clear on what we are trying to accomplish. It is important to make them understand that they have a choice in life. This is what I love about my job: we started very small yet we managed to touch and change so many lives because the people receiving our support became active players in the process. How much emphasis does River of Hope place on childhood in your programmes, how do you engage the locals? CD. We focus on children and young adults. In order to develop a sustainable program in a remote location we need to ensure a strong base. The population of the neighbouring village Selo, with its 800 inhabitants, is fully integrated in the construction and maintenance of the campus and its surrounding agricultural land. In addition we offer them an educational program for the illiterate, and professional courses such as for tailoring and farming. Further programs are under development. How important are links between River of Hope and organisations like the International Children’s Football Alliance? CD. For a small organisation it is vital to have a diverse regional and international network of partners, stakeholders and individuals who support our Centre. We share a common goal to fight against poverty, malnutrition, injustice, etc… We exchange ideas and learn from each other. As supporters of (National Children’s Football Alliance) Football & Peace Project do you feel that there should be more opportunities for children and young people to participate in cross cultural football for fun projects, if so, why do you think it is important? CD. Children are the future! My family is multicultural, and our children grow up with 3 languages, tolerance and respect towards others is a given. We have to give all children the possibility to discover other cultures and religions. As an Intercultural Coach and Relocation Consultant I work with people from all over the world and nothing is more important than tolerance, and that comes from nothing else but mutual cultural understanding. Cross-cultural learning through football is a fantastic tool also for grown-ups! Is there a project that you would like to tell our readers about and how they might like to support the good work being done? Kinshasa to establish the Centre “Tala Mosika”. Construction began in July and we plan to officially open the school in summer 2014. With the right support and understanding of what opportunities lie ahead, fewer parents will deny children their right to an education, and force them onto the streets. Through the attraction of football, we help the street kids to get a chance. Parents and communities are involved in the building of the centre, the educational process and development programs. Children will receive the necessary support to integrate the local educational system, thus becoming independent and confident individuals, ready to face the challenges of their personal and professional lives. We aim to free them and their families from the cycle of poverty and misery by stimulating the local economy so they can help themselves. We are looking for partners in the fields of construction, education, and football as well as funding that will help build a sustainable infrastructure, and offer those needy children education and school material, clothing, food, and medical care. Download River of Hope 2013 Annual Report here.